In these interview excerpts, Grammy winning musician Gillian Welch describes and demonstrates the influential techniques of the Carter family. 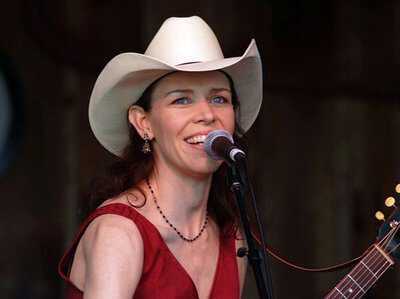 Gillian Welch performing at MerleFest, 2007. Photograph by Forrest L. Smith, III. P.D. I think that the language that is present in there, I think that had a big impact on contemporary music. It's a very interesting language. It's that great thing that happens with traditional music, the particular kind of poetry of traditional music, where it's really refined because it's like a stone in the river. So many hands have passed over it and each hand makes it a little better and by the time the Carter Family were getting some of these songs and putting their hands on them, and doing their great arrangements... Because I hear them as fantastic arrangers. Sometimes I think they were the best arrangers we've ever seen in roots music and that may in fact be their legacy; that the forms of these songs that we know come to us through them. I know I heard Wildwood Flower really early on and was knocked out by Maybelle's guitar playing, like everybody else. But it's funny because people talk so much about her guitar playing and I don't hear people talk about Sara's singing that much and it's huge. I mean, she is the voice of The Carter Family. Maybelle is fantastic but Sara is... one of the interesting things about Sara is... for one thing I had a really strong reaction to it when I heard her because I've got a similar range voice. I'm not a soprano. She's definitely not a soprano so that was cool, I could immediately move into that whole catalog and sing the stuff. I hear this incredibly direct lineage from Sara to Woody Guthrie to Bob Dylan, so I hear Sara's voice in so much contemporary music because of that one direct chain. Duet harmony is for me is one of the great magical things in music. And one of the things that singing as a duet affords you is -- as opposed to if you sing in a quartet or a trio, where you, kind of, have to take your part and stick there so that you don't bump into any of the other singers -- when you're singing in a duet you have this great freedom to sing whatever note you want to sing. And Sara and Maybelle do that where they will go into unison and then they'll split to a broader harmony and you get to create all this different texture and emotional stuff, and I know that's what my partner, Dave, and I try to do. The most unique thing from my perspective is the sort of combination of melody and chords that [Maybelle] played with. I guess it developed really naturally out of having no one to play with, so putting it all together herself. It's a really -- sometimes I think about it -- it's a very interesting way to play lead, because she really was the lead player in their little band. Sometimes I find it kind of interesting that it's a style that a woman came up with because it's kind of unique, that it incorporated the rhythm playing and constantly... so that even when she's taking a lead, she never stops with the support of the whole band. I guess she couldn't, but it's a very interesting style. If I were just playing chords just to sing over and not playing a melody with them, it would sort of sound like... [plays guitar chords]. Okay, so that's no melody. So what [Maybelle's] doing is... [plays guitar in Maybelle's style]. You can hear how much more interesting and how much more of a voice that has than just the straight accompaniment. I'm not really a lead player so the hardest thing for me to show you would be what her lead playing would sound like without any chords, but it would pretty much sound like... [plays guitar with only melodic notes]. That's with the "scratcha scratcha" taken out. 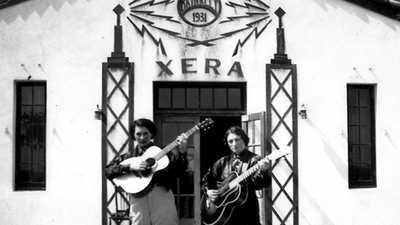 It is kind of unusual, in a way, that you can trace so much of [American music] to one family because there are, of course, a number of string bands and lots of singers that were making records and were on the radio and were kind of the first people to put this great wealth of American folk music and folk songs into a recorded medium. 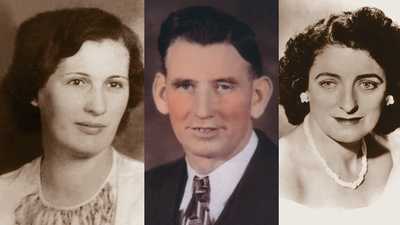 But The Carter Family really has an unusual place in that first generation group, because they're just so prolific. There are so many sides that they recorded. And then those particular arrangements are responsible... Those were the versions that so many next generation guys learned. You really have to look at their take on all of these traditional songs and folk songs as the first sort of blueprint. The first saying, "Now this is how the song goes." Because there are so many different words... I mean, there's lots of different words to Wildwood Flower, but you kind of have to look at their version as a blueprint. 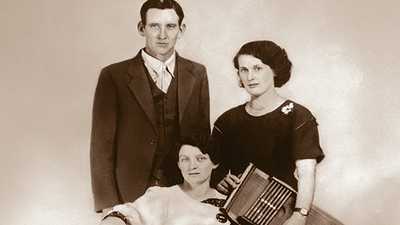 The Carters crisscrossed the country, traveling to New Jersey in 1929 and 1933 for additional recording sessions, and to Louisville in 1931 to record with Jimmie Rodgers. By 1938 the Carters' fortunes were on the wane; then came the Consolidated Royal Chemical Corporation offer for a twice daily radio show, for the princely sum of $75 each per week. Early in childhood Alvin Pleasant (A.P.) learned to play the violin, and it soon became clear that he was a natural musician.